How Do I Prune the Bottom of My Weeping Yucca? 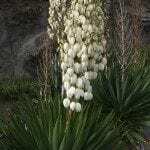 I have a weeping yucca that I planted 5 years ago. It is starting to die on the bottom. How can I clean up the dead growth and renew my beautiful yucca? You can just cut away anything that is dead. Any brown or yellow fronds can go as well as any brittle dry branches. These are dead and will not recover so can be cut away.